From version 2.7.4.4 is it now possible to setup Round Robins with 2 to 8 rounds (the players play each other more than once). This option is availeble in singles, pairs, mixed pairs and 4 players team mode. 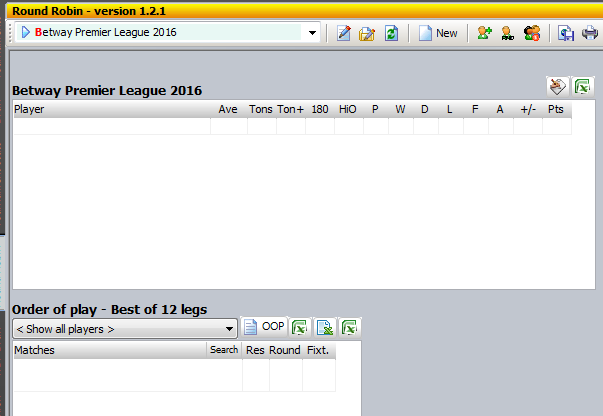 In this tutorial I will use the PDC Premier League 2010 as the sample. 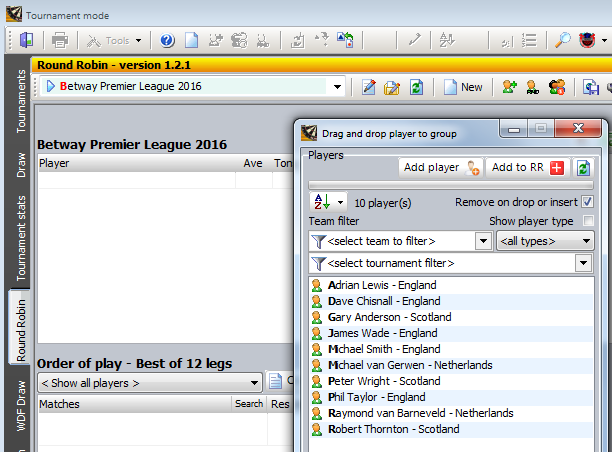 The PDC Premier League 2010 database can be downloaded from the "Downloads" screen in DfW and also from the main page on this site. To setup a Round Robin with multiple rounds, open the "Round Robin" tab in the "Tournaments" screen as shown in the screenshot below. 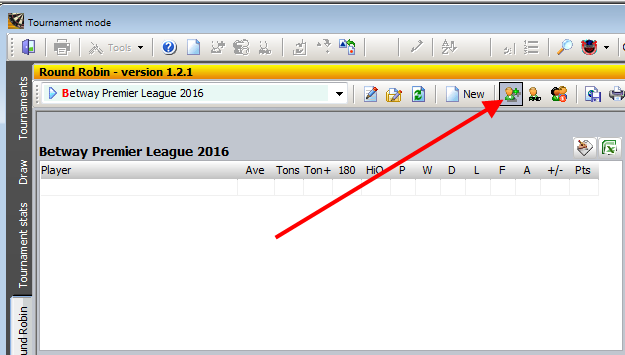 To create a new Round Robin, click the "New" button as shown below. 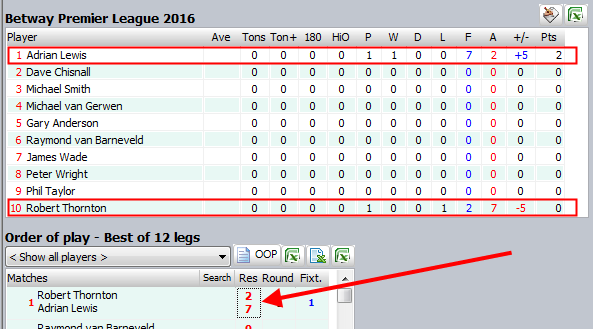 of 12 legs (or first to 7 legs), it is 2 rounds and 10 players in the group (only 1 group). You get 2 points for a win and 1 point for a draw. 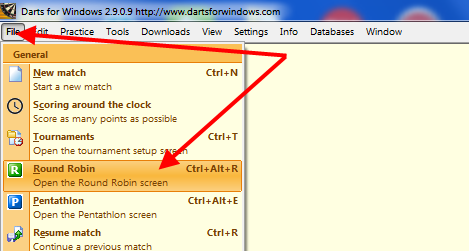 When done with the setup, click "OK" to save and close the window. This is how an empty Round Robin with multiple rounds and 10 players in the group looks like. Next step now is adding the players. The order you put in the players does not matter really. 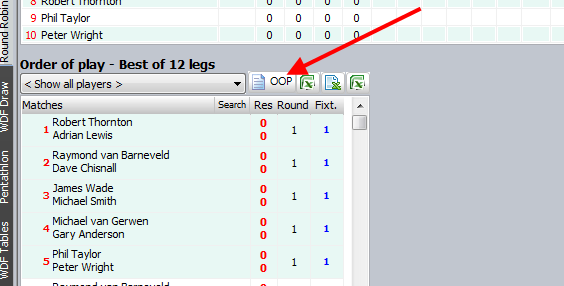 It affects only the order of play ("OOP"), but the order of play can also be changed manually later using drag and drop or you can randomize the Round Robin as shown in the next step. 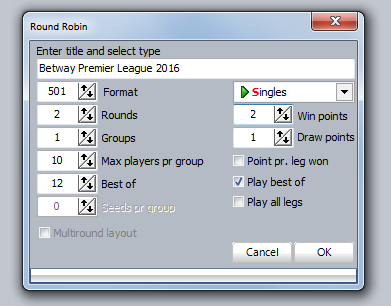 If you want to randomize the Round Robin before you setup the order of play, click the button as shown below. There are several ways you can add the players to the Round Robin. If the list contains only the players who is going to play in this Round Robin, click the "Add to RR" button and DfW will add the players by random. You can also drag and drop the players into the table (the grid on the left) or double click the players, one by one to add them in the order you want. In this sample I start from the top and put in the players alphabetically. The order of play is automatically saved to the database so there is nothing to be done to keep the order. 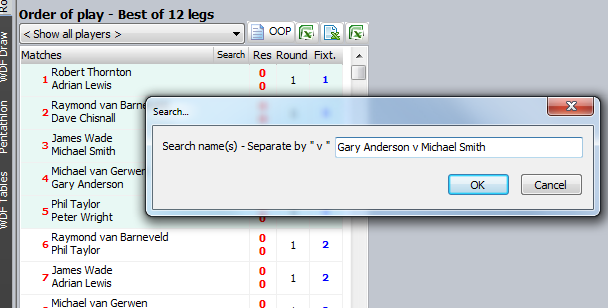 To maintain the table, you can add results manually, drag and drop matches from the "Match log" screen (the line must correcspond to the correct round number, does not have to be the correct match, DfW will find the correct one) or you can start the match from the "OOP" grid (RIGHT click the match) and DfW will put in the result and points for you. 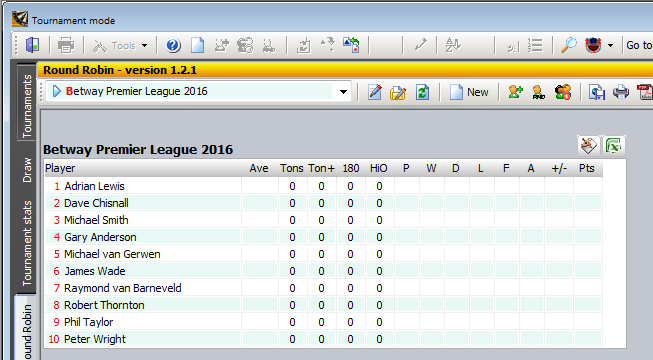 You can filter the players and you can also search for specific matches in the "OOP" grid. Click the small "Search" button in the header of the grid to search for matches. 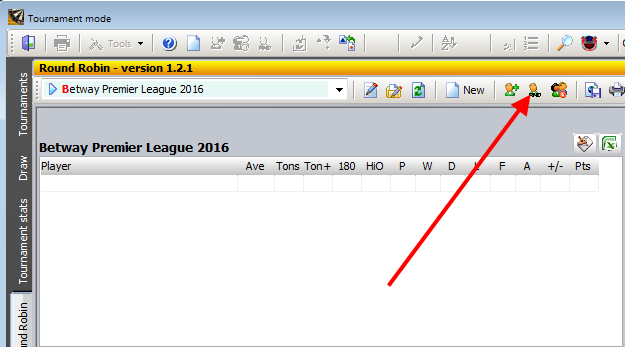 The table will be sorted automatically as soon as you put in a result, a match has been played or added by drag and drop from the "Match log" screen. The sorted table after added a result manually.